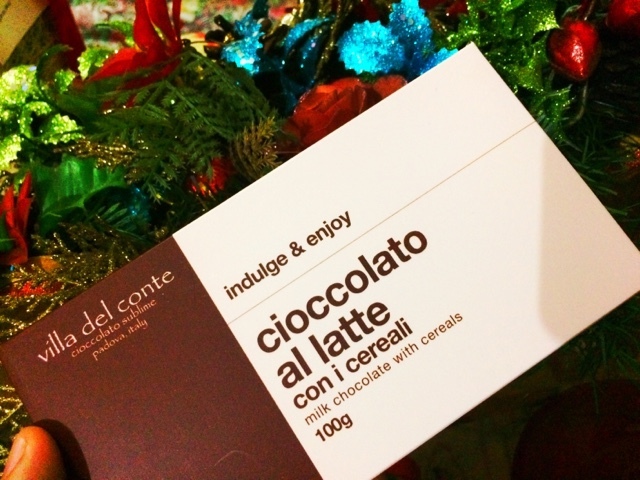 Spoil Them These Holidays with Villa Del Conte Chocolates! If you haven't bought anything yet to give your friends and relatives this Christmas, I just got a really great idea, had to share it of course! When I got back home from an event, a bag full of goodies surprised me big time on the table. It was from Villa Del Conte, and I couldn't contain myself... I just had to write about it. 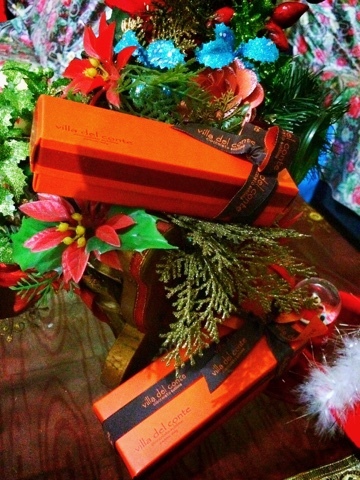 Inside those boxes are sweet decadent chocolates with a 75 year history. I love the praline sticks, the praline balls and dark chocolate. They also have some really good ones with caramel, creme brulee, pomegranate flavor. They also have some other bars inspired by One Direction, a favorite of every teen I know. I find it first class, I find it very touching to get one, this was the perfect way to surprise me bar none. On the card, they told me to indulge and enjoy. 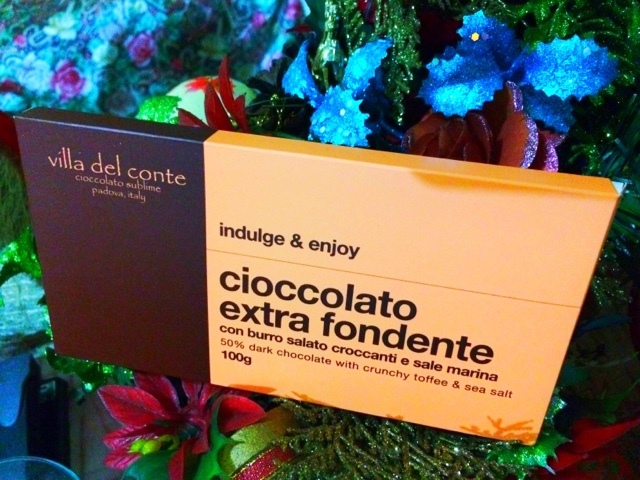 I will oblige of course, with this 50% chocolate with crunchy toffee and sea salt. It's the perfect combo to something a bit bitter and earthy like that. If you want something crunchy, they've got Milk Chocolate with Cereals, something simple, yet very addicting. I can imagine myself sitting in front of the Christmas tree and putting the squares in my mouth one by one. Then a mug of hot chocolate with it haha! 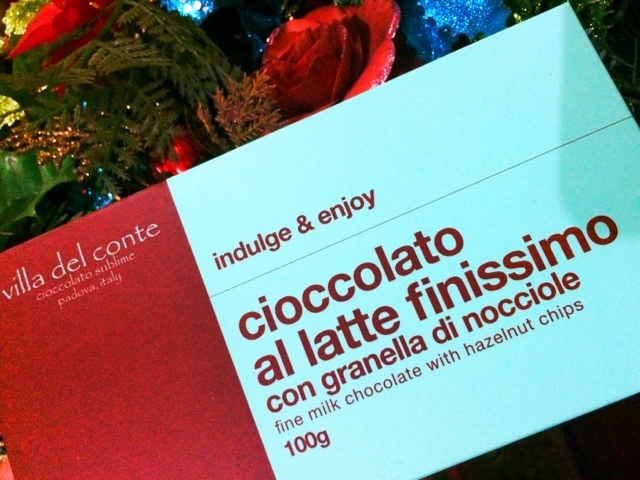 For a more intense chocolate experience, this fine milk chocolate with hazelnut chips does the job. The combination has been tested for ages and if you know Italian people, this is like peanut butter and jelly sandwich on a normal day. I will not share it though, I'm going to be selfish today LOL! For those who want to get boxes of these, they're available at the 3rd Floor of Shangri-La Plaza Mall, at the 2nd Floor of Greenbelt 5, at the Upper Ground level of Robinsons Magnolia, at the Ground Floor of Resorts World Manila, at the Lower Ground Floor of Alabang Town Center, at the Ground Floor of Century City Mall, and at the 2nd Floor of Mega Fashion Hall in Megamall. It's one of the best things you can get for loved ones this Christmas, I'm sure I did! So go ahead and spoil them these holidays! They deserve something special of course!